These two software options are available via LaunchPad, Macmillan’s online course space. Learn more at www.launchpadworks.com. 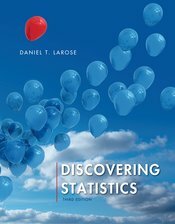 JMP Student Edition (developed by SAS), modeled after JMP, the leading commercial data analysis software of choice for scientists, engineers, and analysts at companies throughout the world, is easy to learn and contains all the capabilities required for introductory statistics, business statistics, and statistics for the life sciences. With the student edition of JMP, students experience the capability to handle large data, visualizations, and analysis for which the professional version is renowned. Additionally, text-specific pre-loaded data sets are included. Two-year access to JMP Student Edition is available within LaunchPad. CrunchIt! is a Web-based statistical program that allows users to perform all of the statistical operations and graphing needed for an introductory statistics course and more. It saves users time by automatically loading data from Freeman/Macmillan statistics textbooks, and provides the flexibility to edit and import additional data. With a familiar Excel®-like interface, users can easily navigate through the program to collect, analyze, and interpret data. CrunchIt! is easy to use, and does not require students to install any software on their PC or Mac. Since CrunchIt! uses the highly respected software R for all statistical operations, users can be certain the calculations and output are correct. Also available in LaunchPad; To Use CrunchIt! with your Macmillan text, click here.